SHARMINI PERIES, EXEC. PRODUCER, TRNN: Welcome to the Real News Network. I’m Sharmini Peries coming to you from Baltimore. British MP Jeremy Corbyn is expected to win the Labour Party elections underway and become the next leader. Corbyn jumped into the race in June on an anti-austerity and anti-war platform, and is a self-described democratic socialist. Polls close on Thursday with the results expected to be announced on Saturday. To discuss these developments I’m joined by Leo Panitch. Leo is the Canada Research Chair in comparative political economy and a Distinguished Research Professor of political science at York University in Toronto. He is the author of many books, among them The End of Parliamentary Socialism: From New Left to New Labor, and Renewing Socialism: Transforming Democracy, Strategy, and Imagination. Leo, as always, thank you for joining us today. LEO PANITCH: Hi, Sharmini. Happy to be talking about this subject, especially. PERIES: So Leo, what’s the significance of Jeremy Corbyn’s popularity and the future of the Labour Party in the UK? PANITCH: Well, it’s an amazing development, really. It is part of what is going to continue to happen through the 21st century. It is part of the renewal of socialist politics in the face of this increasingly unequal capitalism that we’re seeing, one that is unable to exit in any dynamic way out of the crisis, one that is imposing austerity, cutting back on social benefits, et cetera. We’re going to see in one way or another what we’ve seen in Spain or in Greece, and in the British case it’s taking place through the Labour Party. And that’s very exciting. PERIES: And Leo, you tell me that this particular measure of doing a poll for the party leadership is something new. Explain that. PANITCH: Well, I have to say that to understand this properly you really have to go back to the way in which the revolt of the 1960s, the new left of the 1960s, impacted on the Labour Party. It created after the disappointments with the Labour governments of the 1960s an emphasis on participatory democracy and an era of trade union militancy, an emphasis on trying to get not only the unions but the social movements behind the Labour Party as active social movements, having an influence on it over and above the way in which the parliamentarians always ran the Labour Party. There was a campaign for Labour Party democracy through the 1970s, the great voice of that was Tony Benn, the greatest leader the Labour Party never had as its leader. He spearheaded that. There was also a strong representation of that in the local municipalities. Ken Livingston, the greater London council, was part of that. Jeremy Corbyn came out of that municipal politics. And they were running on the slogan that if you can’t democratize the Labour Party you can’t democratize the British state. The way in which leaders were elected was changed by that campaign. It used to be the case that only parliamentarians, existing MPs, voted for the leader. The millions of people in the party, the trade union affiliates, had no say. One of the victories of that movement was to move that to electing a leader being based on one-third of parliamentarians, one-third on the unions, and one-third on local party members. And that was the way in which leaders have been elected ever since. Most recently, partly out of the hubris of the right of the party, the part of the party which ended up as so-called new Labour, the Blairites, who so viciously defeated the Labour left, aided by Thatcherism with a good many of people in the center and the right of the party coming to the conclusion that you had to pull everybody together who was the left of Thatcher, and you couldn’t be bothered with things like democratizing the party, democratizing the British state, democratizing the economy. You just had to get rid of Thatcher. Well, in the end that new Labour actually absorbed a lot of Thatcherism. Sat down with Murdoch and got the Murdoch press off their backs. And you got Tony Blair, and you got support for the invasion of Iraq. Support for the financialization of capitalism through the city of London, and so on. One of the reactions to that was Ed Milliband’s election, who ran against the Iraq war, who argued that the Blairite reaction had gone too far against the membership, against the class basis of the Labour Party. But he himself was standing in the middle, by no means wanting to go back to the kinds of vision that the Bennites had put forward. And as one of the things he did as leader, partly in order to actually distance the party from the trade union bosses, or at least from the claim that trade union bosses control the party, was he moved the party to a one-person, one-vote leadership election. The right was in favor of this, because they tend to think that it’s only a very few of us, a handful of people who watch The Real News, who are actually democratic socialists. All the rest of the population, they think, are enthused by the markets. They were wrong. And what Ed did was he introduced a one-person, one-vote way of electing the party. The parliamentarians don’t have a special vote, the trade union leaders don’t. It’s individual members that do. And partly they were looking to the American primaries as a way of doing this. You could register as a supporter of the Labour Party. And in the case of trade unionists you weren’t affiliated just because you were a trade union member. You actually had to agree to sign up as a Labour Party member. Well, the result of that, astonishingly, since the election this May when Ed resigned and the leadership election was called, is that almost 400,000 new members and supporters have joined the Labour Party. There were only 200,000 in May. They’ve got 80,000 new members in the constituency parties. They’ve got 180,000 trade union members. And they’ve got a couple of hundred thousand supporters who paid three pounds to be able to [vote] in this election. PERIES: Leo, this is a significant development. So give us a sense of what Jeremy Corbyn’s platform looks like. He’s clearly come out against austerity, but what more? PANITCH: Well, he goes back to a lot of the things the Labour left stood for. He wants to reopen the question of whether Britain should have a nuclear deterrent, as with the Scottish Labour party, that is opposed to the Trident submarine, the nuclear submarine which is Britain’s nuclear contribution. He’s in favor of scrapping it. And in fact he is one of the vice chairs of the Campaign for Unilateral Disarmament, which goes back to the British left in the ’60s. He stands for democratizing the party, returning to the party conference, the kind of control over party policy that the Bennites were trying to establish back in the ’70s and ’80s. He explicitly, as you said in the intro, calls himself a democratic socialist, and he very clearly puts the onus for the crisis on the banks. On the financial system. So for all those kinds of reasons he was the vice chair of the Stop the War coalition, which was the big British mass movement against the Iraq war. These are the kinds of things that of course make careerist politicians, who come out of Oxford and Cambridge and decide at a young age that their career will be a Labour Party politician. This makes them tear their heads out–hair out rather, sorry, because they will be seen as too radical by the mainstream press, by the establishment, [et cetera]. Even the Guardian. PERIES: We have a clip here, Leo, of his position on the Iraq war. Let’s have a look. JEREMY CORBYN: The ISIS forces, yes they are brutal, yes they are, some of what they’ve done is quite appalling. Likewise, what the Americans did in Fallujah and other places is appalling. But there has to be seen to be an acceptance of a much wider view of the world than is apparent at the present time [inaud.] government. PERIES: So he clearly took an anti-war position on the war in Iraq. And he’s also at the moment being critiqued quite a bit, Leo, for his position he took back then, and why is this, and how is the rest of the party on this particular issue? PANITCH: Well, on that issue–I think that’s been a key issue. I think that is the thing that got Ed Milliband elected, that those people who stayed in the Labour Party, who didn’t leave it out of despair at the way in which the Blairites embraced Thatcherism and financial capitalism, those who stayed in were disgusted to their core by Blair’s support for the American intervention and his insertion of the British military establishment as part of that. So that was the beginning of the great alienation of the Blairites from their own base. And so that’s been key. But what also is very important, going beyond this, has been the anti-austerity thrust of Corbyn’s policies. PERIES: Let’s have a look, I have a clip of that, his position on the austerity discussion. CORBYN: I’m glad that people are taking notice of our campaign, where we’re challenging the agenda of austerity. Austerity which has led to greater inequality in our society, greater poverty in our society, and now a budget and a welfare reform bill which will deepen that, impoverish more children in large, poor families. Surely we can do better than that. Surely the Labour Party can do better than that and offer a real economic alternative which is about expanding manufacturing industry, expanding our economy, and the welfare state that eliminates poverty and the gross inequality that exists in Britain today. PERIES: So Leo, is the UK and the Labour Party in particular catching up in terms of the wave of anti-austerity activity on the part of social movements in Europe? PANITCH: Yes. You know, I think that while Ed Milliband distanced himself somewhat from Blair’s embrace of neoliberalism he at the same time, partly because he was surrounded by Blairites, was loath to not play the balance the budget kind of line. And he treated deficits with the kind of deference to getting rid of them that most politicians have been cowed into doing. Jeremy has been much more upfront, has been very upfront, about the necessity and the rationality of running deficits in the face of the kind of stagnation that we have. But at the same time, calling for increased taxation on the wealthy. So in other words he represents the reaction that you’ve seen across Europe to the way in which social democracy has embraced neoliberalism. PERIES: Leo, we hope to have you back on Monday after we know the results of the party poll. PANITCH: Sharmini, it’s been great to talk to you about this. And it just goes to show that the struggle for socialism is not a sprint but is a marathon. 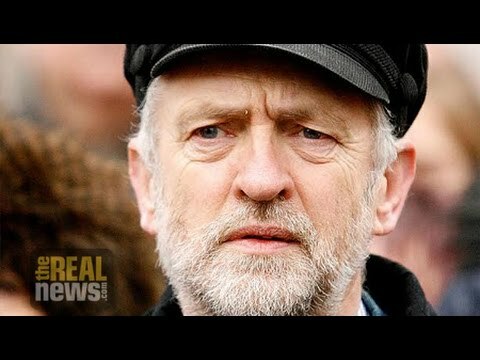 If someone like Jeremy Corbyn, who led the attempt, was one of the key leaders with Tony Benn, of the attempt to turn the Labour Party into an active, dynamic democratic socialist party back in the ’70s and ’80s is about to be elected leader of the Labour Party now 30 years after that attempt was marginalized, defeated, et cetera, you can see that we may yet win this marathon. PERIES: Leo, thank you for joining us, and we hope you join us again on Monday coming up.